Below are common attributes associated to Miss Bessie Beville Camellia. Become a care taker for Miss Bessie Beville Camellia! Below are member comments regarding how to plant Miss Bessie Beville Camellia. No comments have been posted regarding how to plant Miss Bessie Beville Camellia. Be the first! Do you know how to plant Miss Bessie Beville Camellia? Below are member comments regarding how to prune Miss Bessie Beville Camellia. No comments have been posted regarding how to prune Miss Bessie Beville Camellia. Be the first! Do you know how to prune Miss Bessie Beville Camellia? Below are member comments regarding how to fertilize Miss Bessie Beville Camellia. No comments have been posted regarding how to fertilize Miss Bessie Beville Camellia. Be the first! Do you know how to fertlize and water Miss Bessie Beville Camellia? Below are member comments regarding how to deal with Miss Bessie Beville Camellia's pests and problems. No comments have been posted regarding how to deal with Miss Bessie Beville Camellia's pests and problems. Be the first! Do you know how to deal with pests and problems with Miss Bessie Beville Camellia? Looking for Miss Bessie Beville Camellia? Get Miss Bessie Beville Camellia fresh and large directly from the grower to your garden! Buy Miss Bessie Beville Camellia online from the nursery wholesalers and save BIG! 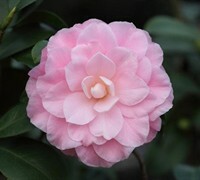 This camellia has a large pink formal double flowers. It is slow to bud up as a young plant but a heavy bud setter after the first couple of years. This camellia has more of an open spreading growth habit than other camellias.